It takes at least 6 weeks to cycle a saltwater aquarium. It takes 6 weeks to cycle (establish the biological filter) in a new saltwater aquarium. The original method used for cycling a tank consisted of putting a fish or two in a new tank, then waiting up to 6 weeks for the nitrobacter and nitrosoma bacteria to form and grow. It is now known that there are a number of methods which can cycle a tank in as little as one day. Water changes are the only way to reduce nitrates which are the end product of the nitrification process in a saltwater aquarium. There are a number of methods which can be used to reduce or even prevent nitrate buildup without performing a water change. 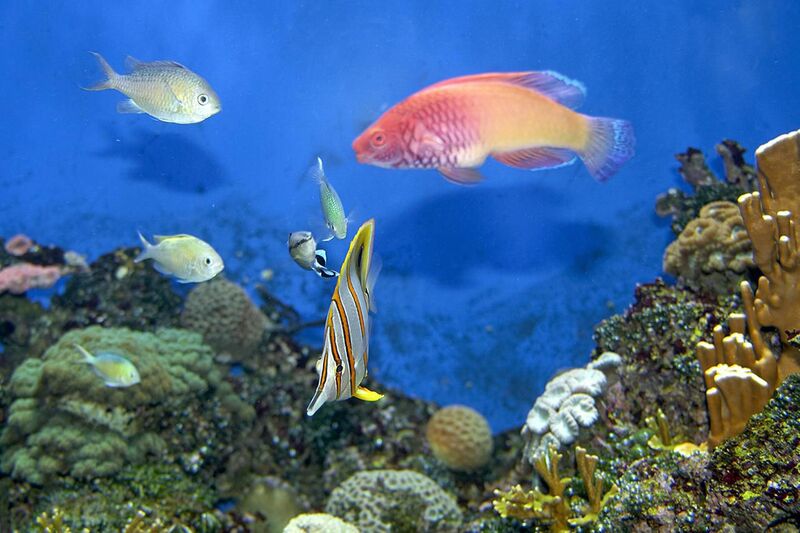 The ideal reef tank temperature is between 72° and 78° Fahrenheit. The ideal reef tank temperature is between 76° and 78° Fahrenheit. The water temperatures of most of the reefs where your corals came from are a lot higher than 78° F.
Tangs (Surgeonfish) are very sensitive to nitrates. Tangs (Surgeonfish) are more sensitive to nitrates than other fish. Surgeonfish are no more sensitive to nitrates than any other species. Tangs have endured nitrate levels of hundreds of ppm for extended periods of time with no ill effects. Massive water changes are harmful to saltwater fish and invertebrates. Massive water changes to quickly reduce nitrates and other toxins are harmful to saltwater fish and invertebrates. While a rapid change in salinity, temperature or pH can be harmful to fish and invertebrates, a rapid reduction in nitrates does not adversely affect them. Coral Banded Shrimp kill fish. The Coral Banded Shrimp is a scavenger as well as a parasite picker, and may attack other shrimp, but will not normally attack fish. Many people who find their ​Coral Banded Shrimp consuming a dead fish or invertebrate assume that it was killed by the shrimp. However, the shrimp is just doing what it does for a living: Scavenging. All LFS people are knowledgeable and always give you good advice. You can depend on the people in your LFS to be knowledgeable and to give you good advice. There are a great number of LFS owners/employees who are well experienced in saltwater aquariums and will give you good advice. However, a majority of them (usually younger workers) have little or no knowledge or experience in this subject which requires time to learn. Bio-Balls or wet/dry filters create nitrates. Bio-Balls and wet/dry filter material can trap detritus and other tank debris which break down and eventually create nitrates. If the Bio-Balls are cleaned regularly, they don't create any more nitrates than a substrate with the same materials in it. Popeye is caused by secondary bacterial infections in a fish's eye(s), caused by ammonia burns or other physical damage. Ich Can be Transferred From One Tank to Another Through the Air. Ich (Cryptocaryon and Oodinium can be transferred from one tank to another via contaminated surfaces, such as nets, hands, fish, etc. What's the Ideal Temperature for a Saltwater Aquarium? How Many Fish Should You Put in a Saltwater Aquarium?